iRealHousewives | The 411 On American + International Real Housewives: Are RHOCheshire Stars Rachel Lugo And Dawn Ward Still Feuding?! Rachel Lugo and Dawn Ward's relationship was tested this season of The Real Housewives of Cheshire after they were caught in the middle of a feud. Rachel was in Tanya Bardsley's side, while Dawn stood by newbie Hanna Miraftab. So where do they stand now? Meanwhile, Ward revealed on Twitter that regardless of her ups and downs with Lugo, they love each other despite their disagreements. 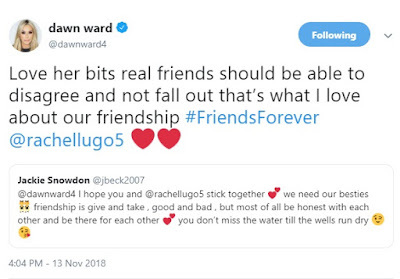 "Love her bits real friends should be able to disagree and not fall out that’s what I love about our friendship #FriendsForever @rachellugo5 ❤️❤️"